Shrinking down even more, the Funko One Piece Mystery Minis set features leading characters from the manga series in a blind-box format. While One Piece already has a decent Pop! 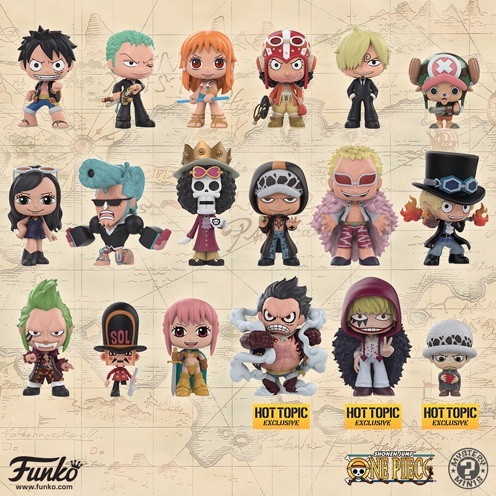 selection, the Funko One Piece Mystery Minis lineup builds upon that. Collectors can find favorites like Tony Tony Chopper, Monkey D. Luffy, Zoro, and Nami. Buy One Piece Mystery Minis on Entertainment Earth. The 18-figure set also features three options that are exclusive to Hot Topic. These choices include Corazón, the "Gear Fourth" version of Monkey D. Luffy, and Trafalgar Law as a child. That should leave 15 figures in the main release of Funko One Piece Mystery Minis. Although the sealed box means that each figure remains unknown until opened, the individual figure rarity can also add to the suspense. With 12 boxes per case, it will likely take two or more cases to build the set, and that doesn't factor in the exclusives. Check back as the Funko One Piece Mystery Minis box odds will be added when available. Corazón Corazon Hot Topic Exclusive One Piece Funko Mystery Mini Toei Animation! The release date was set for the end of August and now mid September but Amazon has it set for December 31. Im willing to bet Amazon is right on this one. I purchased a box from my comic book shop and one from hot topics hoping to get most of them and some exclusives. Funko Pop! One Piece Tony Tony Chopper Flocked Funimation Exclusive Box.